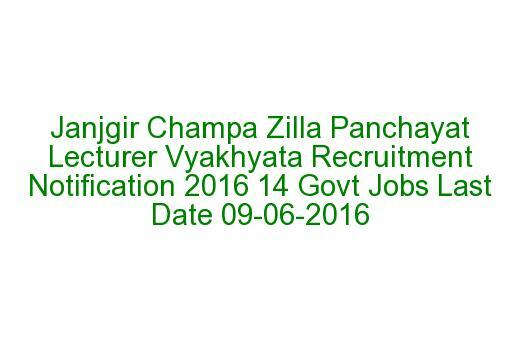 Janjgir Champa District Lecturer Recruitment-2017: Panchayat Raj department of janjgir Champa District has been released notification to recruit the 14 lecture jobs in government schools of Janjgir Champa district. Eligible candidates can submit their applications on or before 09-06-2016 closing hours. Degree with B.Ed candidates are eligible for this recruitment of Janjgir Champa district lecturer recruitment 2016. For more details please see the information below given. See the official notification here.. There are total 14 vacancies available in total 7 subjects. Subject wise Panchayat/Lecturer/vyakhyata vacancies are given below. As on 01-06-2016 age limits are 21-35 years. Selection for this Lecturer recruitment will be based marks secured in qualifying exams. Eligible candidates can send/submit their applications along with all required documents and 2 self addressed cover each having Rs.5 stamps on one cover and Rs.22 stamps on another cover. Application to reach "Chief Operations Officer, CG Janjgir Champa Zilla Panchayat Office" before 05:00 PM on date 09-06-2016. 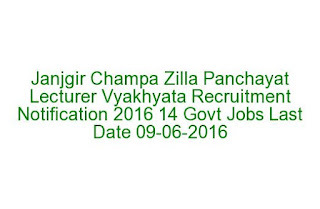 Please share this CG Janjgir Champa Zila Lecturer Recruitment details with your friends.